Anyone use any of the 35gr nosler ballistic tips in this cartridge? I am reluctant to use the 35 gr vmax in the ps90 because it seems like it would cause trouble in the magazine being so short, however this 35gr nosler appears to be longer and would lend itself to having a more suitable COL. I am thinking about ordering some and giving them a shot. If your looking for something in that weight range the Barnes Varmint Grenade 36gr is a better choice. I have loaded them and they are pretty accurate. I started at 6.6 grains and that is too much for stock PS90. Looks like 5.9 to 6.1 would be good starting load. Good luck and post your results. You can load them to a length of 1.585" for cartridge length. ninthinning wrote: I have loaded them and they are pretty accurate. Alright, thanks I'll order some of those on my next midway order. 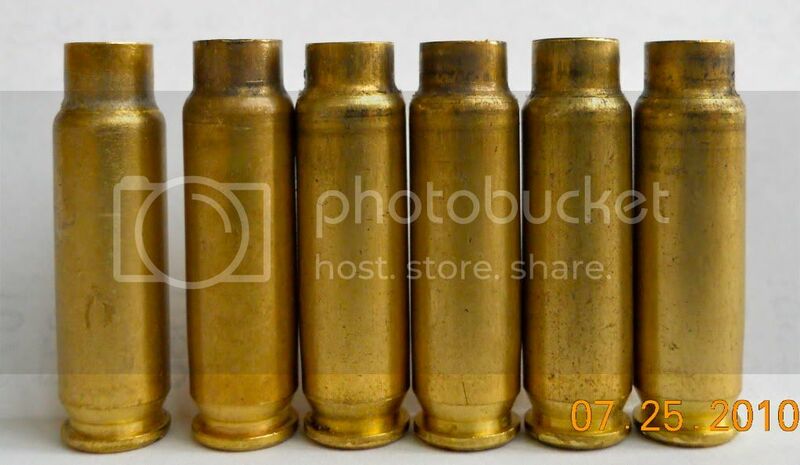 I plan to order a little of alot of different bullets and see what I like the best and just buying them in as big a quantity as possible to save money. panzermk2 wrote: If your looking for something in that weight range the Barnes Varmint Grenade 36gr is a better choice. Out of curiousity, why are they better than the 35gr nosler? Side note: I have been to 10-15+ gun shops ranging from large to literally someone's garage and none of them had any hs7 OR any Accurate powders of any kind. Not really shocked about the hs7 but hard to believe no one has accurate around here. VeTTeMaNC486 wrote: Side note: I have been to 10-15+ gun shops ranging from large to literally someone's garage and none of them had any hs7 OR any Accurate powders of any kind. Not really shocked about the hs7 but hard to believe no one has accurate around here. But no accurate powders? Yeah, that's hard to believe. Yeah wasn't supprised about the hs7. I want some Acc.#7 and don't wanna pay hazmat shipping for a pound of powder to just test with. They are longer, stabilize better in the pistol and you can push them faster. VeTTeMaNC486 wrote: Yeah wasn't supprised about the hs7. I want some Acc.#7 and don't wanna pay hazmat shipping for a pound of powder to just test with. You'll generally be able to get more kinetic energy w/ 40gr ballistic tips. I have heard good things about the 35gr LF Noslers....but havnt had the opportunity to try them myself. I don't have a way to flair the necks for the flat base bullets, could I just get buy with a rather large chamfer? Then use Hornady 0.224 seat die for seating flat base bullets. There has been some discussion of using the Nosler 35gn BT bullet for the FsN5.7 pistol. Since the Nosler plant is close by, I dropped in and bought 100 of those bullets and loaded some 1X Sharch cases with True Blue to test them. The details of the tests are described below. Loads: 6.1gn, 6.3gn, 6.5gn, 6.7gn, 6.8gn, 6.9gn (I didn’t fire the 6.8 and 6.9gn loads for reasons described below.) All loads were weighed using an electronic scale and accuracte to 0.02gn. The photo below shows the SS197SR (blue & white box) cartridge alongside the 35gn Nosler BT loaded cartridge. The photos below show the cases. From left-to-right are first, an unfired re-sized 1X case, then the fired cases from the SS-197SR, 6.1gn, 6.3gn, 6.5gn and 6.7gn. The primers for these same cases are shown next. For reference, I fired 10 SS197SR through the M2. The average speed was 1690 fps with an extreme spread of 50 fps. I stopped shooting because at this point, while the cases and primers didn’t show any significant overpressure (the 6.7gn primer was flattened, though), I was concerned about the large variation in bullet speed. Are there any opinions about why this might be happening? Should I shoot the 6.8gn and 6.9gn, or leave well enough alone? I note that, on the target, the bullets for all shots (including the SS197SR) fell into a consistent group that were all about the same size. I won’t mention the size because that would probably say more about my less-than-good shooting skills than anything meaningful about the accuracy of any particular load. The point is, the loads were all of comparable accuracy. Since Panzer is giving out some absolutely awesome data (these pictures and the explanation of what's going on is solid gold for a 5.7 reloader - BIG THANKS to Panzer for this stuff!) I thought I'd chime in here. I happen to know that 6.3 grains of True Blue under a 40 gr V-Max, lit by a small rifle primer, on average produces almost exactly 50,000 psi at around 70 degrees F (ambient). This is a pressure maximum for 5.7; you should never load to this level. 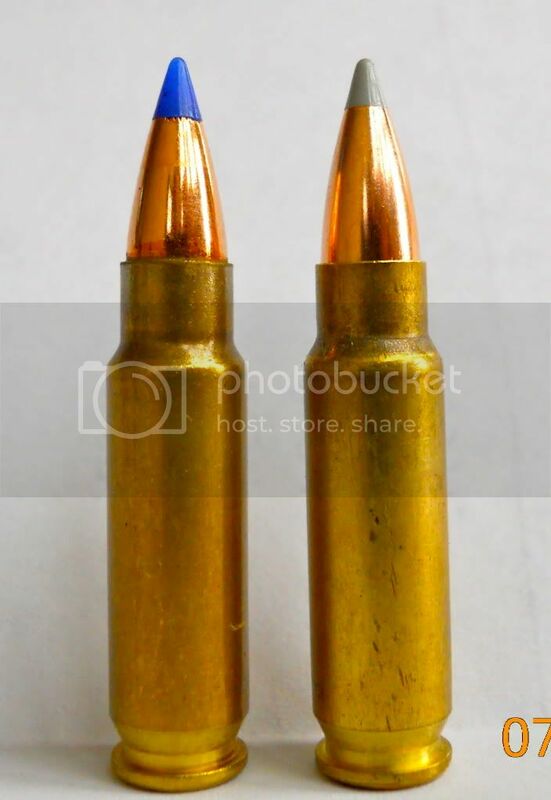 You should always load well below this, and I consider 5.9 - 6.0 grains of True Blue to be a very hot, barely safe charge under a 40 gr V-Max loaded to 1.580". The 35 gr Nosler will allow you to go up a couple tenths of a grain of True Blue, but no more. I'd say pressure max for a 35 gr Nosler is probably right around 6.5 grains of True Blue. At 6.7 grains, with an ambient temp of 85 F, you were already on your way to proof load pressure. I'd consider 6.2 grains of True Blue to be a safe max for this 35 gr bullet, and even then I'd be careful. The wild variation in velocities you got at 6.7 is due to wild variations in pressure. Panzer already explained why and how. If I was you, I'd pull the hotter ones and try again at 6.2. I think you'll come out in the mid 1900's (probably around 1950 - 1960 fps average). Please take all this as the positive, constructive criticism it is; in the end it's your gun and your life... As always, I just want folks to be safe and enjoy their shooting sports for a long, long time. Thanks for the pics Jay.